Who doesn't love the taste of a tender steak fresh off the grill? A great-tasting steak begins with a good cut of meat. Use this guide to get the meaty details you need! Most people go to a butcher, supermarket, or an online store to scour seemingly endless steak options. To make sure that a good quality steak lands on your dinner plate, you need to beef up your knowledge of steak cuts. The grade of the steak speaks mainly to the quality of the meat based on both marbling and age. The second factor is the cut. The right cut of steak can make or break your barbecue. Different cuts have different qualities. These 10 steak cuts will whet your appetite and leave your carnivorous bicuspids clamoring for more. The grade of the steak speaks mainly to the quality of the meat based on both the marbling and age. The second factor is cut. This particular steak is considered the "king" of steaks mainly because it's actually two steaks in one. On one side you have a New York strip, and on the other is a rather large filet mignon. The porterhouse is a thicker cut and has much more of the tenderloin relative to the loin portion. It comes best when grilled, but can also be sautéed, broiled, or pan-fried. This steak is named after its T-shaped bone. It's similar in appearance to the porterhouse, yet with a smaller portion of the filet mignon side. T-bone steaks are cut closer to the front, and contain a smaller section of tenderloin. They are best grilled or broiled to medium-rare temperature; the meat near the bone tends to cook more slowly than other parts of the steak. This is a relatively lean cut of steak. Top sirloin differs from sirloin steaks in that the bone and the tenderloin and bottom round muscles have been removed. It is often marinated to tenderize it. It's a good choice for cutting into cubes, and skewering with vegetables for grilling. Kabob! Often labeled "Santa Maria steak," this cut is most popular on the Central Coast and Central Valley regions of California. It has begun to enjoy increasing favor elsewhere for its full flavor, lower fat content, and comparatively lower cost. The tri-tip is flavorful because of excellent marbling and is tender as long as you don't overcook it. It is best marinated and then grilled. This remains one of the most popular cuts of beef. It has a lot of connective tissue, which in turn gives it great flavor, but makes it less tender. This steak is usually marinated before being broiled or grilled. Flank steak is always served cut across the grain in thin slices. Watch the steak sauce! A tablespoon of your favorite barbecue steak sauce can add 100 calores or more to you meal. Try using lower-calorie options such as lemon juice, hot sauce, horseradish, wide vinegar, and yellow mustard. This is a staple and classic at any good steakhouse. It has an excellent amount of marbling, is tender and full-flavored. Many people prefer this cut cooked rare, or blue, showcasing the delicate flavor and naturally tender texture. Internationally it is called a "club" steak. In the United States and Canada it is known as New York strip, strip loin, shell steak, or Kansas City strip steak. 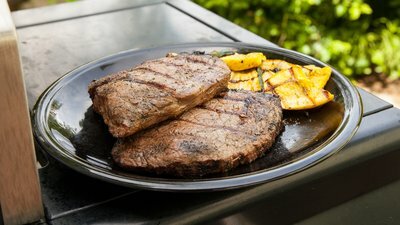 The New York strip steak is ideal for grilling. This is the most tender cut off the cow. It's not the most flavorful steak since it does not have a bone attached, but it can be wrapped in bacon or served with your favorite sauces and spices. In France this cut is called filet de boeuf, which translates to beef filet. It can be broiled or grilled, but remember to cook this cut quickly to seal in all the goodness. This is not the most tender steak on the menu, but what it lacks in tenderness, it more than makes up for in flavor. This cut is best when marinated and cooked quickly over high heat by grilling or broiling, and served rare or medium-rare to avoid toughness. The flat iron is the top blade steak, which is derived from the tender top blade roast. Flat iron steaks (also known as butler's steak in the UK and oyster blade steak in Australia and New Zealand) usually have a significant amount of marbling. It's considered by many to be the finest cut of beef available. It's served best grilled or broiled.